This week in “The 7” we’ve got chocolate games, artsy dating, wonderful art, beautiful music and slot machines. Pretty much the perfect weekend. All except Sunday. We got nothing for Sunday. Monday, we got. But Sunday, no. Sunday is for suckers. Really. I witnessed it. Last week. Wednesday. Six-ish. It was around then that my dear friend and Mary Kay consultant, Asia Morris, approached me sheepishly. By sheepishly, imagine a sheep, utterly vanquished, completely void of anything approaching principles, or a spine, with eyes the color of defeat. As you may know, my dear friend and food-taster, Asia Morris, had long ago barged herself into this column, committing the journalistic equivalent of squatting—i.e. squatalism—something for which I had forgiven her. She repaid me for this kindness by questioning my right to exist, wondering how I slept at night and constantly suggesting that I habitually missed deadlines. Why would she do this? Though Asia is a dear friend and godmother to my pet rat, even those closest to her will allow that she is duplicitous and unpredictable, you know, like a sheep. And, the bit about deadline, well, that just came out of nowhere, though, I suppose one could argue it had something to do with the fact that as I write these words this column is—lemme check my watch—a day and a half late. Over the past few years, Downtown-based Intertrend Communications has drawn pedestrians on Broadway to its annual Lunar New Year installations. This year, outside the creative agency’s offices, in the historic Psychic Temple building, is their latest offering: a giant, digital slot machine that represents the wealth, luck and prosperity attached to this, the Year of the Pig. It was vandalized twice, the first two days. First, the lever was damaged and then the black box containing the mechanicals for the machine was stolen off the wall to which it was bolted. So, if you’re in the neighborhood, go by and try your luck. Please resist the urge to pillage. The installation is located at Intertrend Communications, 228 E. Broadway, and will be up until March 5. Tune in today at 6:30 p.m. to either Facebook Live or IG Live and see the fantastic conclusion to our Unofficial Long Beach State Mascot Contest. We’ve been running the contest for weeks and weeks and have received so many great concepts for a new mascot for the school. We will be recognizing all artists during the broadcast and giving out awards in four different categories, including the winner of our readers’ vote which attracted more than 3,800 responses. 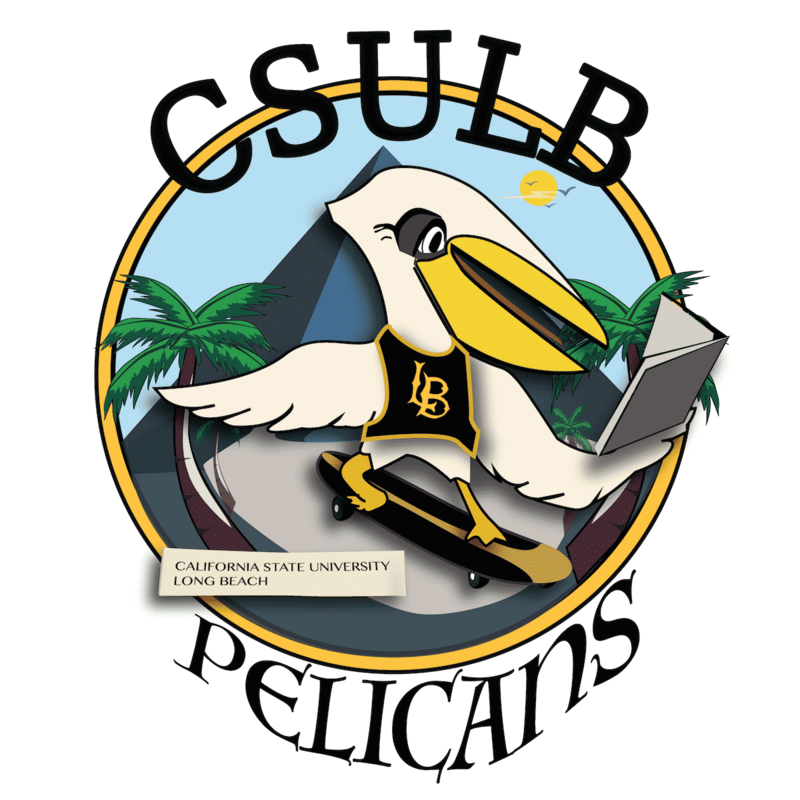 Now that Cal State Long Beach itself is running a contest to find a new mascot, it may be that some of the contestants from this contest will find their way into that very official contest and end up a winner. Tune in! The Museum of Latin American Art (MOLAA) will host a panel discussion today from 2 to 3:30 p.m. on the work of artist Judithe Hernandez, who is presently the subject of the exhibition “Judithe Hernandez: A Dream is the Shadow of Something Real.” Joining Hernández are Dr. Charlene Villaseñor Black, Professor of Ibero-American Art and Chicano/a Studies at UCLA and Dr. Cristina Castellano González, Research Professor at Universidad de Guadalajara in Jalisco, Mexico. The discussion moderator is Betty Dávila, Executive Director of Self-Help Graphics and Art. Hernandez was born in Los Angeles and was the only female member of Los Four, the seminal and influential collective of artists who helped launch the Chicano Art and Los Angeles Mural Movements of the 1960s and 70s. She is regarded as one of the important visual artists of the period and has exhibited extensively in the United States, Europe, and Mexico, and continues to chart an unprecedented path as an artist, educator and community leader. 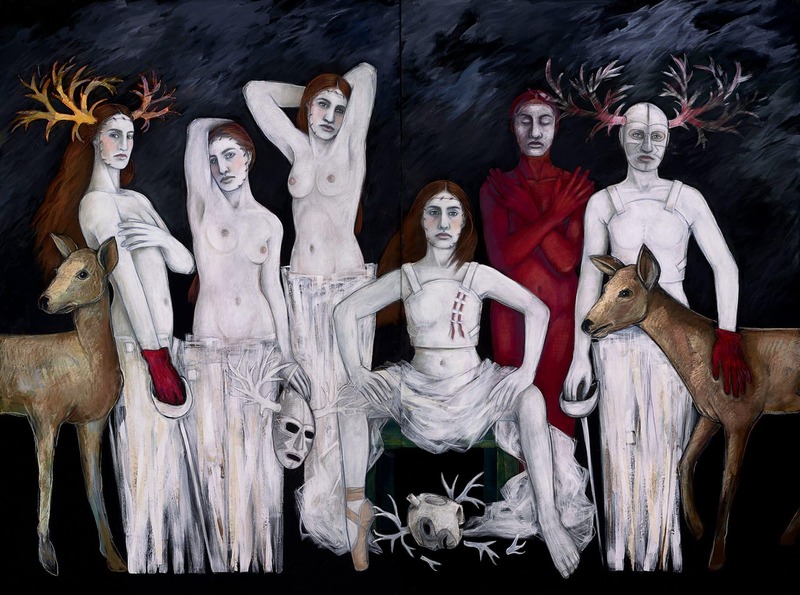 Her evocative portraits of women navigating invented landscapes—a style she has developed over the last 40 years—are enshrouded in symbols from a vast lexicon of Western and pre-Columbian art, as well as an encrypted personal iconography. The Museum of Latin America Art is located at 628 Alamitos Avenue. For more information click here. The 15th Annual Belmont Shore Chocolate Festival is happening today, with more than 25 restaurants offering all manner of chocolate and other sweets. You don’t have to pay to get into the event, but you do have to buy tickets that you then exchange for your sugar fix, you know, like money. You can get 12 tickets for 10 bucks. Sweet! The event starts at 11 a.m. and you can snag your tickets in front of the Chase Bank at 5200 E. 2nd St.
There’s also going to be contests like the homemade chocolate dessert contest (noon to 1 p.m.) and the Hoff’s Hut Chocolate Pie eating contest (3 to 4 p.m.), an event that promises to be equal parts delicious and gross, i.e. grosslicious! 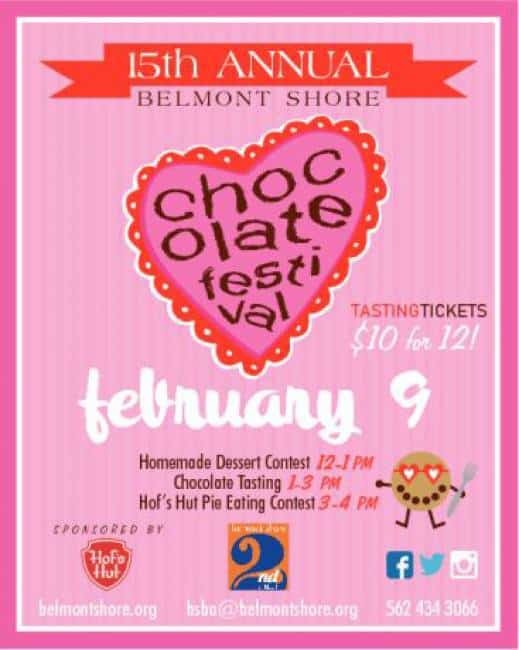 The Belmont Shore Chocolate Festival will take place on 2nd St., you know, where all the stuff is. For more information click here. Speaking of art discussions, the Paint, Sip Speed Date event proposes to use art talk as a way to get to some heart talk (sorry). 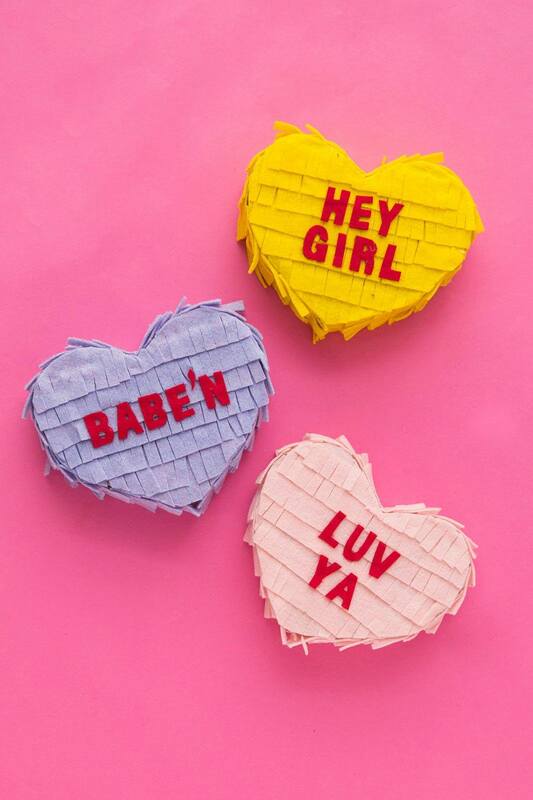 This speed dating event will match potential mates in an arty setting where the women will be stationed at their canvases and then, every 5 to 10 minutes, a new fellow will come around and begin to create art with them. It’s kind of like Ghost, just totally different. And the sip part, well, that’s a little something to free up the artistic spirit. The event is for people between the ages of 25 and 40. You’ll get a complimentary drink and some snacks but you’re free to bring your own bottle of whatever you like. 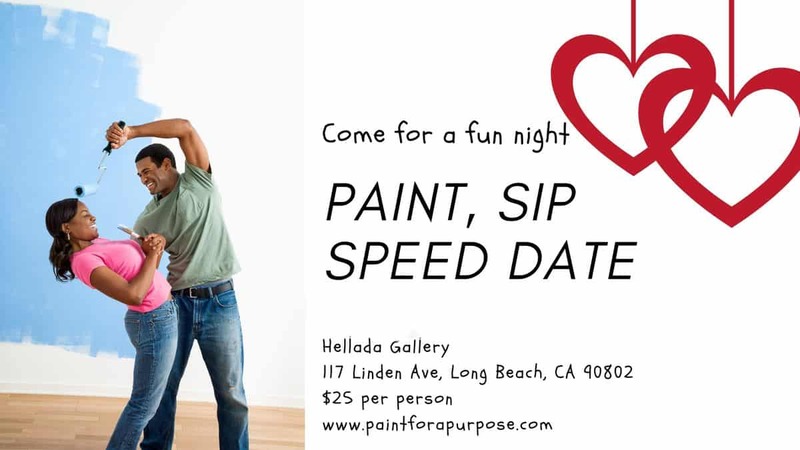 Paint, Sip Speed Date takes place between 7 and 9 p.m. at the Hellada Gallery located at 117 Linden Ave. For more information, click here. The wonderful Musica Angelica Baroque Orchestra will present its “RESOUND Mozart!” tonight under the direction of Music Director Martin Haselböck. Haselböck’s passion for this playful repertoire is evident as he directs a concert featuring star soprano Sherezade Panthaki and concertmaster and concerto soloist Ilia Korol. RESOUND Mozart! features some of the most beautiful concert arias, a duet for Soprano and Violin, Mozart’s virtuoso D-Major Violin Concerto, and one of his wonderful symphonies. Here’s how the evening breaks down: Symphony no. 1 in E-flat, Concerto for Violin and Orchestra in D-Major, Solo Motet “Exsultate, jubilate” for Soprano and Orchestra, Aria “Voi avete un cor fedele” and Symphony no. 29 in A-Major. 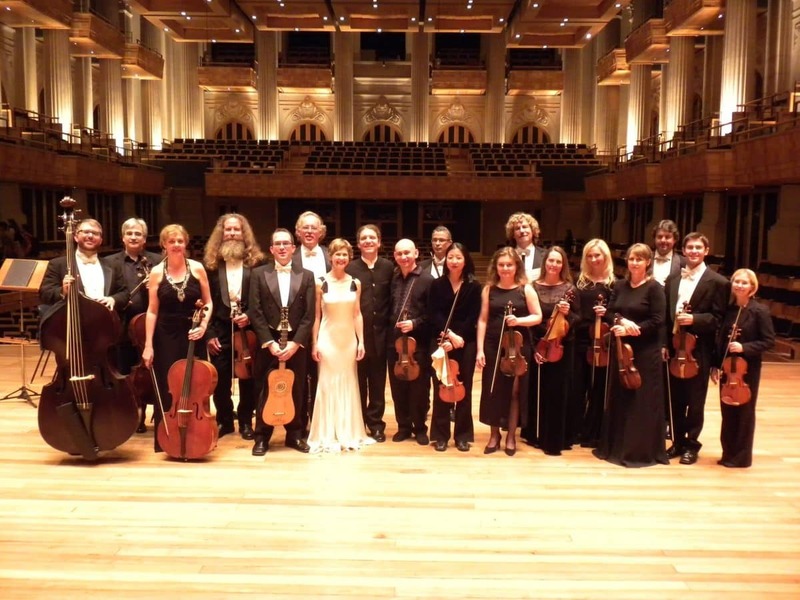 In its 25th season, Musica Angelica musicians perform on original and replica instruments presenting sounds heard by the composers and performers of the period. Musica Angelica Baroque Orchestra’s “Resound Mozart!” takes place tonight at 7 p.m. at the Beverly O’Neill Theater, 300 E. Ocean Blvd. For more information, click here. Call 562-349-0100 to get a ticket. For more information, click here.